What if you used local botanicals for flavour, rather than marketing? An interesting challenge and one we rose to. So expect blackcurrants from Wexford, apples from Cork and elderflower from Waterford. Damn, this gin is so local let’s just call it after the most famous person ever to come out of West Waterford – Robert Boyle. 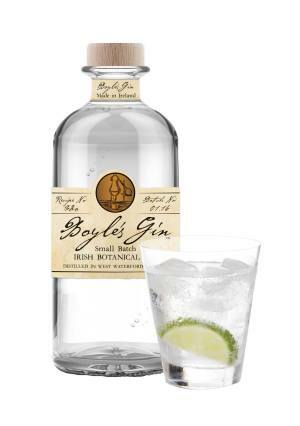 And so Boyle’s Gin was born. For those who don’t know, Robert Boyle was born in Lismore Castle, Robert Boyle was an alchemist and founding father of modern chemistry. He’s most famous for Boyle’s Law, which we print on each and every bottle so you can memorise it. Every year we see more and more releases in the Irish craft gin sector. The quality of some of these products is outstanding and it demonstrates the skills of the new breed of distillers around Ireland. Made by Blackwater Distillery in Waterford, our judges were impressed by its fruitiness and balance.